I found this idea on Pinterest and the guys legs reminded me of how mine used to look "back in the day" before age and HRT took over. 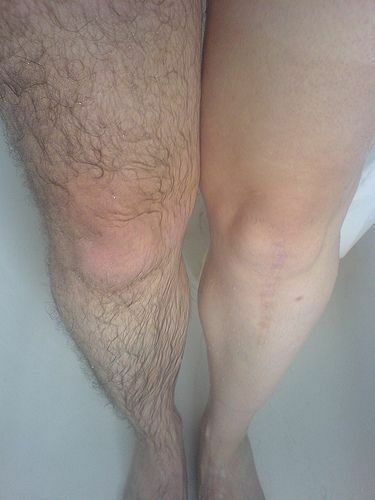 To make a long story short, I went through periods of time when I couldn't shave my legs and then when I did-I faced what the guy is facing in the picture. I was known to clog a few bathtub drains. The problem I faced also was I hated the smell of the hair removers too. 1Tbsp of iodine 2% 1Cup of baby oil Rub your hairy area with the mixture and let set for only 5 minutes. Then gently wipe away with a damp cloth. Viola!!!! NO MORE HAIR! As with anything else though-I would test this idea on a small part of your legs! My problem in summer is my legs have the "snow white" look of the person above. To give them a little color I use one of the popular tanning moisturizers. I had to really practice to use them correctly to not leave me looking orange or streaked when I go bare legged.